Iran preps for nuclear sprint? Iran's FM, nuclear chief reveal IR-8 centrifuges 20-times faster than current ones to be used after deal signed, threatening fast breakout. Iran's negotiator in the nuclear negotiations and its nuclear chief revealed on Tuesday that after a final deal is signed by a June 30 deadline on the framework reached last week, Iran will unleash its most advanced centrifuges for uranium enrichment, threatening a quick turnover in producing a nuclear weapon. 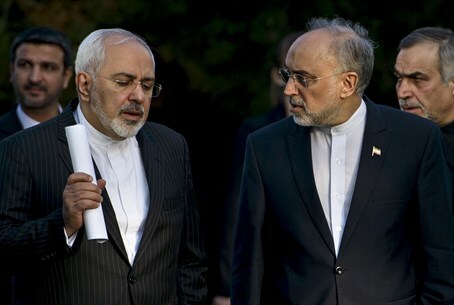 Iran's semi-official FARS news agency reported on a closed meeting held Tuesday by Foreign Minister Javad Zarif and Atomic Energy Organization of Iran (AEOI) chief Ali Akbar Salehi, in which they briefed members of Iran's parliament on the deal being finalized. In their statements, they said Iran's most advanced IR-8 centrifuges will be used as soon as the deal removing world sanctions against Iran begins. The report noted the two said the advanced centrifuges enrich uranium 20 times faster than the current IR-1 models, meaning they would radically reduce the breakout time needed for Iran to obtain a nuclear arsenal. In the meeting Zarif and Salehi told the parliament "that the country would inject UF6 gas into the latest generation of its centrifuge machines as soon as a final nuclear deal goes into effect by Tehran and the six world powers," according to the report. "The AEOI chief and the foreign minister presented hopeful remarks about nuclear technology R&D which, they said, have been agreed upon during the talks, and informed that gas will be injected into IR-8 (centrifuges) with the start of the (implementation of the) agreement," Iranian MP Javad Karimi Qoddousi was quoted as saying by the site. Qoddousi also said the Iranian foreign ministry will present a "fact sheet" showing Iran's version of the agreement to parliamentarians in the next few days. Iranian and US versions of the framework have shown numerous contradictions, with the issue of advanced centrifuges being primary among them. The US version claims Iran agreed to not use its advanced centrifuges, including IR-2, IR-4, IR-5, IR-6 or IR-8. However, the Iranian text says "on the basis of solutions found, work on advanced centrifuges shall continue on the basis of a 10-year plan," apparently contradicting the American version. This point is crucial, as experts have anticipated that under the deal Iran will be able to develop its centrifuge technology and reach a point where it can make a three week dash to obtain a nuclear weapon. Israel has pointed out that of the 17 states with peaceful nuclear programs, none enrich uranium as Iran is being allowed to continue doing by the deal. The statements come after US President Barack Obama admitted in an interview that as a result of the deal, Iran will be able to reach a "zero" breakout time by 2028, meaning it could produce nuclear weapons immediately whenever it wanted to.